PwC New Zealand, a leading treasury advisory provider in New Zealand, has collaborated with treasury software developer, Hedgebook, to create the foreign exchange hedging Strategy Tool. The Strategy Tool is an add-on module to the Hedgebook treasury management platform aimed at small-to-mid sized businesses that are exposed to foreign exchange markets. A key part of PwC’s treasury advisory role is to provide strategic and tactical foreign exchange hedging advice within a company’s approved risk management framework. Implicit within PwC’s role is to monitor client’s financial market risk positions and provide specific and tailored hedging advice. In order to do this effectively, PwC relies on timely and accurate client risk position and exposure information. Some of PwC’s treasury advisory clients already use Hedgebook to record and report their FX hedging transactions and positions. 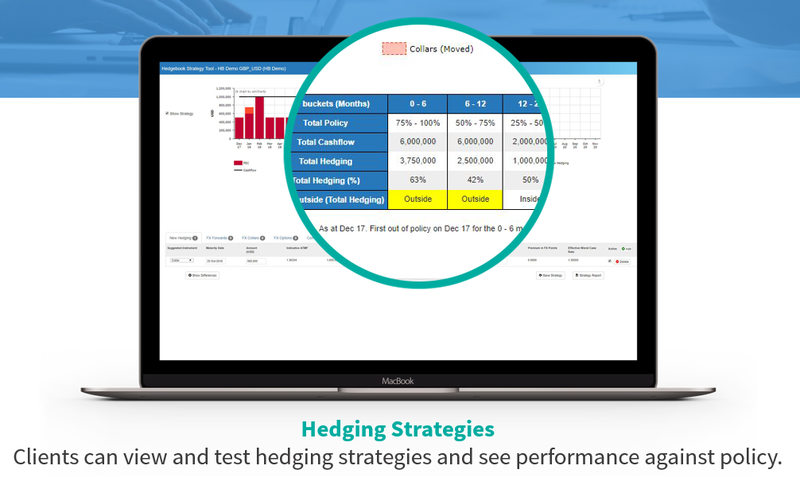 Until now, Hedgebook had limited functionality to incorporate “what-if” hedging analysis when considering the impact of new or re-structuring of hedges. Hedgebook provides its users with an easy-to-use treasury management system to record, report and value foreign exchange derivatives such as forwards and options. 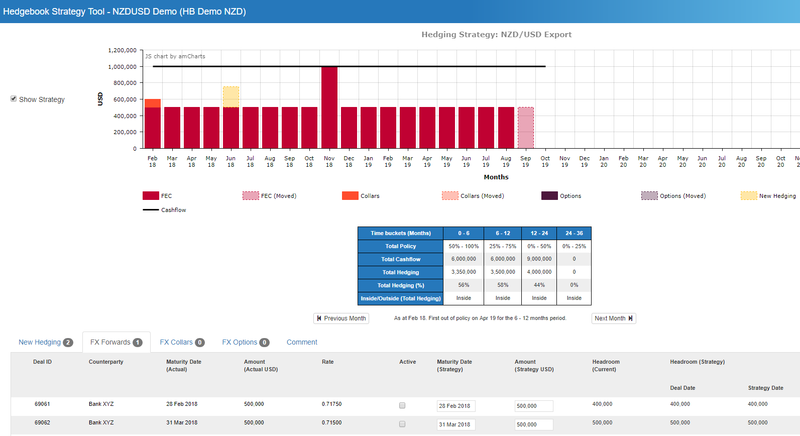 The development of the Strategy Tool module gives users additional visibility over the impact of proposed or hypothetical hedging transactions on their hedging position (including at points in the future). For example, a common practice amongst companies managing FX hedging risk is to leave orders with their bank or FX broker at target FX exchange rates. By adding these orders into the Strategy Tool businesses will clearly understand the impact these orders will have on the hedging position if/when they are filled. The Strategy Tool can also scenario test the impact of a new forward FX contract, or changing the terms of an existing FX contract. The Strategy Tool combines the existing hedges with projected foreign currency cash flows and enables users to add, remove, restructure, maturity extend or shorten any hedges in order for these to line up with the (often changing) timing and amounts of forecast FX cashflows. Users can now have access to the Tool – co-developed by leading treasury advisor, PwC and the treasury software developers – that means you project and understand the impact on your hedge position when making strategic decisions around foreign exchange hedging. Hedgebook is excited to work with PwC Treasury Advisory, New Zealand to add further functionality to what is a widely used treasury management system in New Zealand and Australia (https://www.hedgebookpro.com/our-clients/). Hedgebook’s mission is to provide a low-cost solution to the small-to-mid size corporate market which relies heavily on error prone spreadsheets. The Strategy Tool module is now available to all New Zealand Hedgebook users whether advised by PwC Treasury Advisory or not (certain conditions apply). Contact us here to arrange a demo: https://www.hedgebookpro.com/contact/. Despite a backdrop of trade wars, Brexit and other geo political uncertainties most regions have experienced an environment of increasing interest rates as the outlook is interpreted as generally positive. This has been most pronounced in North America but also felt in the UK, Australia and Europe. 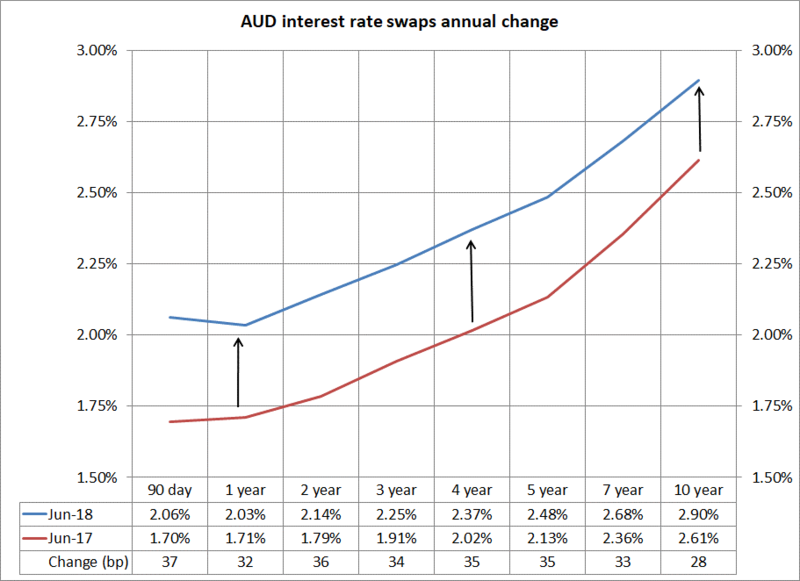 An interest rate swap is a financial instrument used by many companies to manage their interest rate risk. 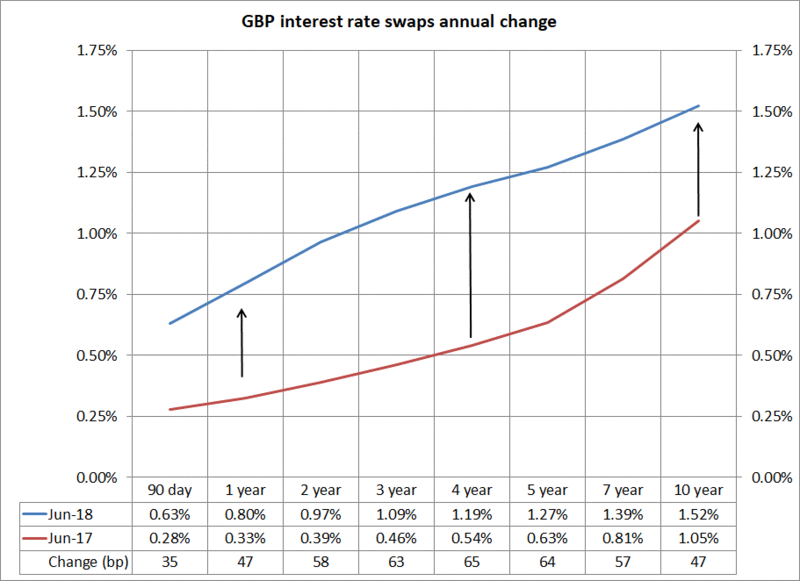 A swap that converts floating interest rate exposure to a fixed interest rate exposure is used to hedge against increasing interest rates. 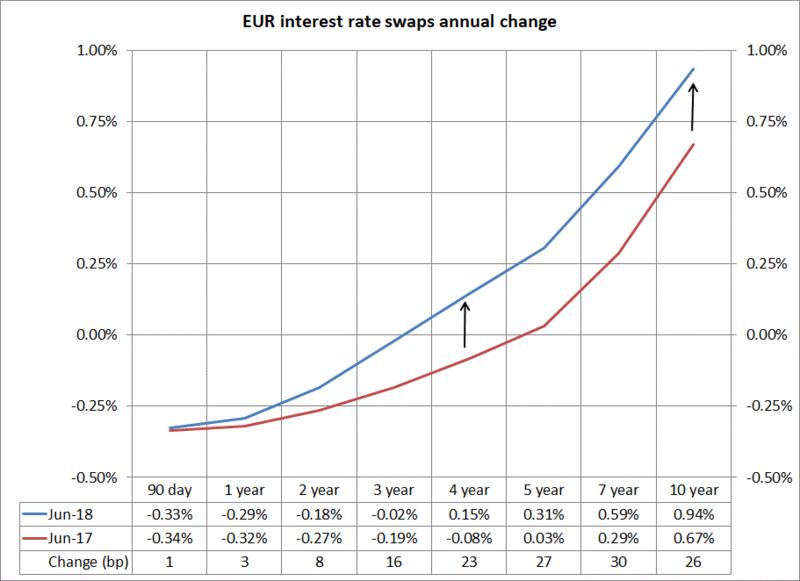 When it comes to year-end reporting, companies that have used interest rate swaps to hedge debt will see an improvement in the valuation of these swaps, either a less negative mark-to-market or a positive mark-to-market depending on the rate at the time the interest rate swap was transacted. 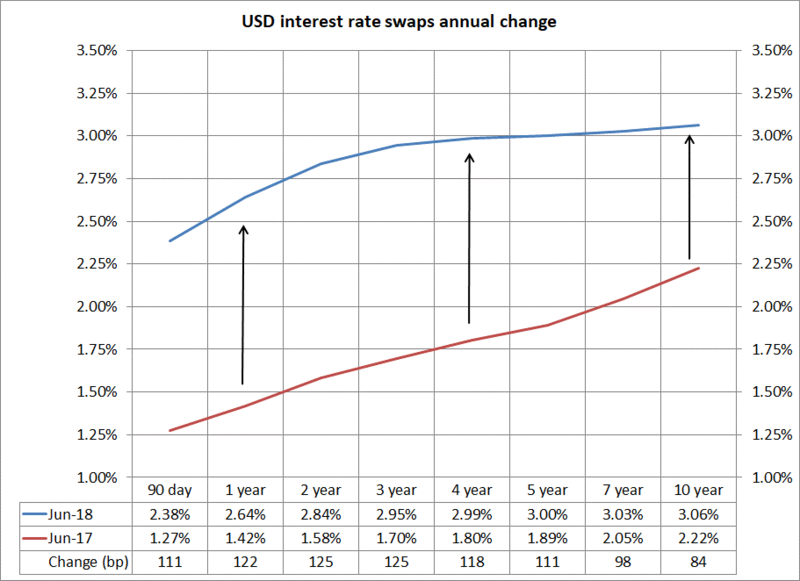 Many companies entered long dated swaps at what appeared to be historically attractive levels, only to see global interest rate fall further as the post GFC environment worsened and interest rates stayed lower for much longer than most expected. 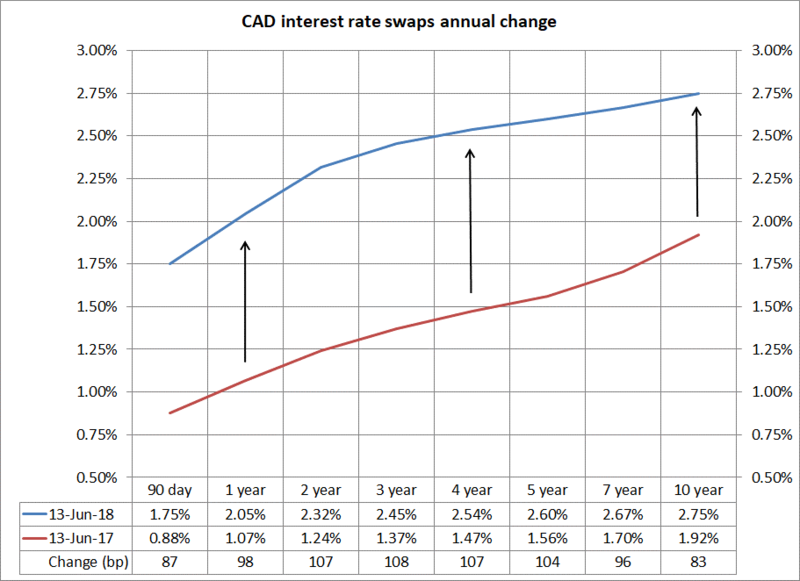 As economic conditions improve (trade wars aside) and interest rates climb higher then this has a positive impact on valuations of pay fixed swaps used by borrowers. At year-end reporting time many companies will be experiencing a positive impact on the P&L from revaluing their interest rate derivatives (those not hedge accounting). 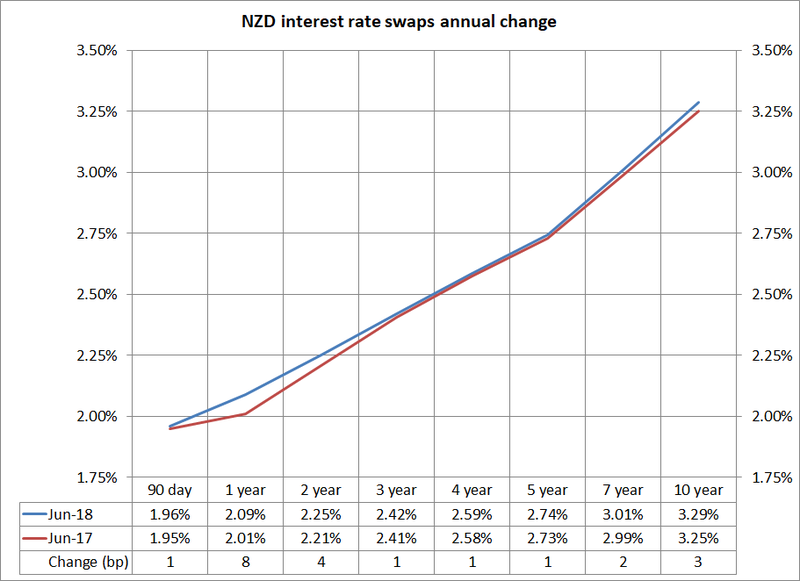 The charts below are a 12-month snapshot of the yield curves. The US has increased the most whilst NZ has gone sideways. Download Hedgebook’s “Confidence amidst complexity” eBook for further information around reporting requirements of interest rate and foreign exchange financial instruments. Somewhat ironically, it is our observation that structured option products for FX hedging are heavily used by small-to-mid sized commercial firms and often overlooked by larger organisations. Many treasury policies exclude exotic options, unless approved by the board as an exception. No question there is a level of complexity about structured options but they do have a place in a hedging programme when trying to achieve extra FX gains, within acceptable risk parameters. We have witnessed first-hand simple businesses that have an FX hedge portfolio entirely made up of complex structured options, arguably inappropriate for the size and (non) complex nature of the business. At the other end of the spectrum there are sophisticated companies with experienced treasury personnel that are prohibited from transacting any “non-vanilla” structures. As with most things in life it is about striking a balance. A hedge portfolio should consist of a mix of instruments from the vanilla end of the spectrum such as FX forwards, to the more esoteric such as barrier options and leverage. Crucially, the company entering the option structure must understand the potential outcomes. The litmus test for this is being able to explain it to management/the board. Trying to manage these instruments within a spreadsheet is a fraught exercise and will likely lead to misrepresenting the hedge profile. The sellers of these type of options e.g. banks and FX brokers, want to ensure they have done so in an entirely responsible manner. New regulations such as PRIIPS put the onus on sellers of options to ensure the buyer understands exactly what they are committing to. From the buyers perspective, understanding the hedge position and the potential profitability impact from movements in exchange rates is vitally important. Hedgebook has continued to add to its library of instruments – the latest being knock-ins and knock-outs. Although these types of instruments may not be suitable for everyone, Hedgebook provides the confidence to both the banks/brokers selling option structures, and the companies buying them, that they are being sold/managed appropriately and any future surprises at expiry are removed. The recent return of volatility to financial markets has served as a reminder of how quickly conditions can change.